All those of you who’ve encouraged me, please say hello to Swati, media person, executive producer, woman of today and Weekend Epicurean. Swati and I know each other through a dear friend U, and when she expressed her desire to start a food blog, i told her of my tryst with blogging and how much i had grown personally from this little space i share with so many of you. When i told her of the joys of writing and finding your niche in this space, of meeting people and making friends, it didnt take her long to start her own blog. Please stop over and send her your wishes!! Goodluck Weekend Epicurean…. may you have a beautiful journey. Now for a an easy recipe for the blazing hot summer’s when the last thing you want to do is stand in the hot kitchen…. this recipe pretty much needs no babysitting, and is full of wonderful flavour. Makes a working night dinner with some hot steamed rice. Ok, if you are feeling indulgent, then roast some papad and add some pickle… but i ain’t going to stand in the kitchen longer than i have to light the flame under the cooker!! Take all the ingredients for the dal except the salt in a pressure cooker and add the 11/2 cups water to it. (leave out the tadka stuff). Cook it for 2-3 whistles, let the steam release, mash well with the back of a ladle or with a dal masher. In a small tempering pan, heat the ghee or oil, add the cumin and mustard seeds and allow to splutter, add the dried red chillies and wait till they change colour to bright red, add the curry leaves now and take off the heat. Add this to the cooked and mashed dal. Mix well. Serve with plain steamed rice or rotis. remember we went to spencer’s(?) when i visited, you showed me the mixed dals…. I make something like this but adding a bit more for the lazy person inside of me. I add mixed boiled vegetables (cauliflower, peas, carrots, f.beans) and let it boil. No need to make additional vegetable with rice. thanks nan…. she’s the kind of girl you’d want to hang out with… thanks for adding her to reader… yes…the dal was on my part, an effort to incorporate more varieties into the daily meal plans… i was in a tur dal rut for a while!! 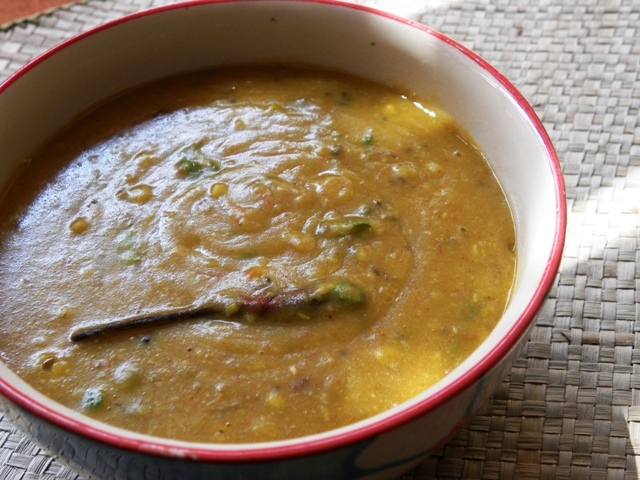 Dal looks yummy and easy to make..